Epoxy shield pot Hole Filler is a pre-mixed, ready-to-use cold patch asphalt repair that permanently patches pot holes and large cracks. This advanced technology and environmentally friendly formula remains workable to temperatures as low as 5 o C and provides superior adhesion to the asphalt base. The low odour formula makes it easier to work with, and because there are no Volatile Organic Compounds (VOCs), its better for the environment. EPOXYSHIELD<sup></sup> Asphalt Patch & Crack Fillers' advanced formula is a revolution in asphalt repair. It's stronger than asphalt and resists shrinkage, revitalizing asphalt driveways to a like-new, even surface. The multi-purpose, dry powder formula is easily mixed with water to obtain the desired consistency of a trowelable patch or pourable crack filler. EPOXYSHIELD<sup></sup> Pot Hole Filler is a pre-mixed, ready-to-use "cold patch" asphalt repair product that permanently patches pot holes and large cracks. This advanced technology and environmentally friendly formula remains workable to temperatures as low as 5C and provides superior adhesion to the asphalt base. The low odour formula makes it easier to work with, and because there are no Volatile Organic Compounds (VOCs), it's better for the environment. EPOXYSHIELD<sup></sup> Premium Rubberized Crack Filler is formulated with urethane-fortified polymers to produce a flexible, durable, long-lasting seal over cracks in asphalt surfaces. 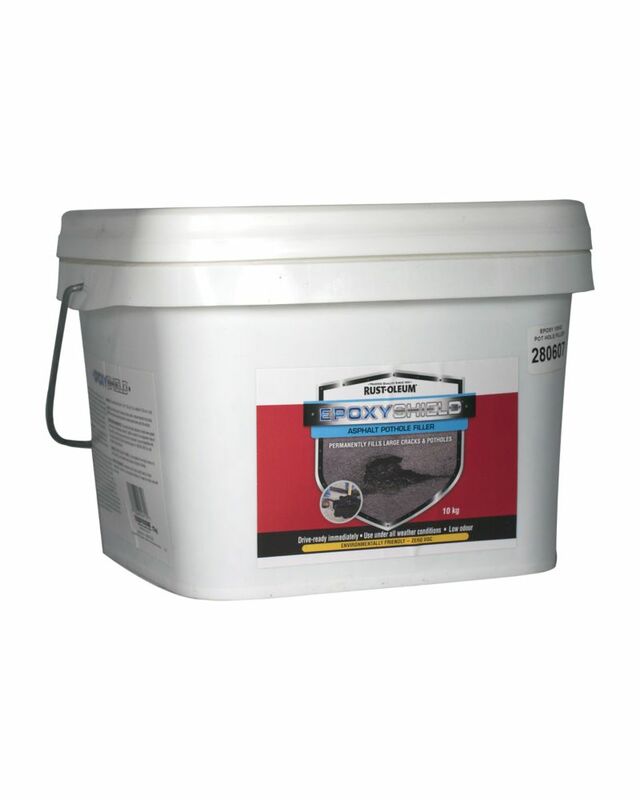 10kg Pothole Filler Epoxy shield pot Hole Filler is a pre-mixed, ready-to-use cold patch asphalt repair that permanently patches pot holes and large cracks. This advanced technology and environmentally friendly formula remains workable to temperatures as low as 5 o C and provides superior adhesion to the asphalt base. The low odour formula makes it easier to work with, and because there are no Volatile Organic Compounds (VOCs), its better for the environment. 10kg Pothole Filler is rated 1.0 out of 5 by 1. Rated 1 out of 5 by Fraz05 from Waste of time and money - Do NOT Buy! I purchased this product because I wanted to fill few cracks on my driveway. It says on the container that it can be used for "cracks and potholes". After I purchased it and took it home with all the expectation that I had it would do the job, it was a big disappointment. In the bucket was some huge stones (approximately 1/2") it was hard and dry. There were insufficient tar or whatever the black stuff is, in the bucket. I had no choice but to spread it out to fill a pot hole - Worst Idea! I could not even get it compressed with the stamper because of the size of the rocks. Unfortunately I could not return it. I had to use the regular cheap asphalt to get the job done. I have to say the the label was vague as well.